Criminal charges are watershed in Libor probe, but authorities say dozens more were involved at UBS alone, and other major banks are under investigation. Prosecutors have reached a milestone with the announcement of the first criminal charges in the Libor interest-rate fixing scandal, but there's still much more to be done. "The good news is they're prosecuting two people," said Dennis Kelleher, CEO of the financial reform group Better Markets. "The bad news is there's dozens more they've got to get to." At UBS alone, at least 45 people were involved in or aware of attempts to manipulate rates, according to U.K. authorities. All told, more than a dozen of the world's largest financial institutions are facing investigation. In announcing Wednesday that UBS had agreed to pay $1.5 billion in connection with the controversy, U.S. officials revealed charges against two former senior UBS traders: Tom Alexander William Hayes, 33, of England, and Roger Darin, 41, of Switzerland. Contact information for attorneys of the two men, for whom the United States will seek extradition, was not immediately available. A Department of Justice spokeswoman didn't rule out the possibility of additional cases against UBS employees, saying the investigation "is still very much ongoing." UBS spokeswoman Karina Byrne said "more than three dozen" bank employees had been disciplined in connection with the scandal through firings, suspensions and reduced pay. The Libor controversy first garnered widespread attention earlier this year. Libor -- short for the London Interbank Offered Rate -- is a collection of rates generated for various currencies across 15 different time periods. The quotes are then used as benchmarks for roughly $10 trillion in loans and some $350 trillion in derivatives. 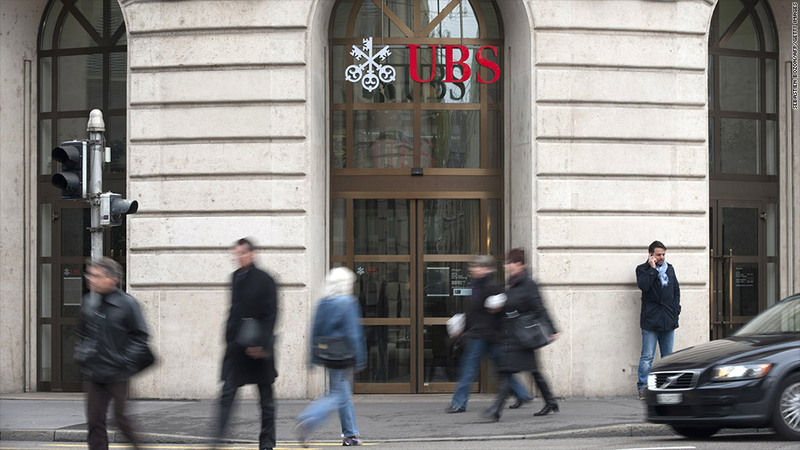 The UBS investigation revealed that bank employees attempted on hundreds of occasions between 2001 and 2010 to influence rates to benefit their trading positions. Certain traders had their pay "directly connected to their success in trading financial products tied to Libor" and related interbank rates, the Justice Department says. UBS employees also made artificially low Libor submissions around the time of the financial crisis to make the bank appear more creditworthy. British bank Barclays paid roughly $450 million in June in a settlement with U.S. and U.K. regulators over similar Libor-related conduct. Additional penalties are expected, with firms including Citigroup (C), Deutsche Bank (DB), JPMorgan (JPM) and HSBC facing scrutiny. The UBS case documents include a number of excerpts from electronic communications in which Hayes, Darin and unidentified colleagues allegedly discussed their attempts to move rates. "[C]an we try to keep it on the low sid pls?" Hayes allegedly wrote in a 2008 chat message to Darin, who was responsible for UBS' yen Libor submissions. "You can point to certain documents where it's very clear what they intended to do, and that's what prosecutors will benefit from," said Michael Clark, a defense lawyer and former federal prosecutor. Beyond colluding with one another, some UBS employees paid bribes to outside cash brokers who collected information on interbank lending to enlist their help in skewing rates. "BE A HERO TODAY," a UBS trader wrote in a 2009 chat message to a broker in a bid to push rates higher, according to British authorities. In addition, Hayes allegedly worked with counterparts at three other unnamed banks to influence their Libor submissions. The Barclays documents, too, include portions of messages from unnamed traders trying to influence Libor submissions both from Barclays and other banks. Employees at Barclays aren't protected by the firm's non-prosecution agreement, but none have been charged with wrongdoing. The Libor investigation has drawn in officials from around the world who could potentially mount prosecutions. Earlier this month, British police made their first arrests in the case, detaining and questioning three men.